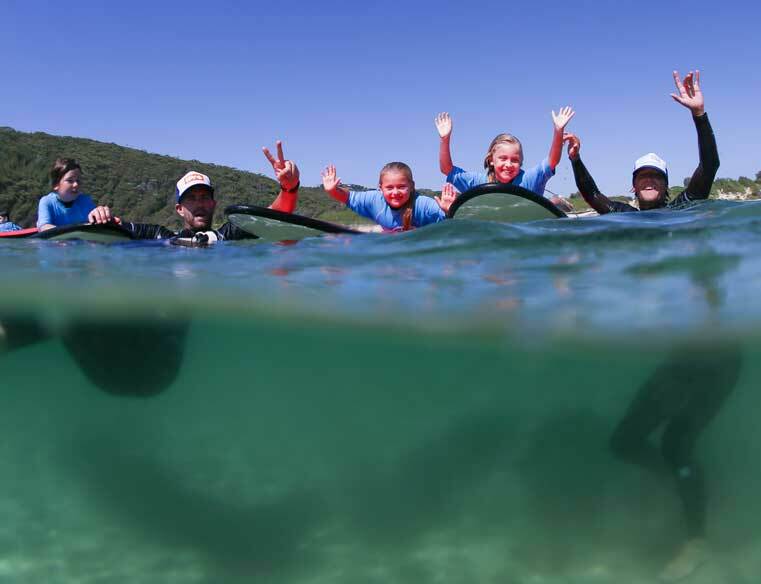 Welcome to Port Stephens Surf School & Sup School located at 4 perfect locations One Mile Beach, Birubi Beach, Fingal Bay Beach & Dutchmans Beach, located in the blue water wonderland of Port Stephens. Come and meet our friendly staff & let our professional, fully qualified & experienced instructors guide you through the thrills and spills of surfing and stand up paddle boarding! We lead the way in delivering fun, well-structured, encouraging surfing tuition, teaching one of Australia’s greatest lifestyle sports, helping people of all ages enjoy a healthy and long life interest!So Come & have a go! Experience one of the most exciting & popular recreational activities on the planet! In 2002 Luke Michalak approached world ranked professional tour legend & now good mate Simon Law, as Luke heard he was looking at starting up a Surf School in the Port Stephens area. Luke approached Simon & they had a chat about starting the Surf School. Simon & Luke then undertook lessons from the famous Matt Grainger of Manly Surf School obtaining there Level 1 Surf School Certificates and Bronze Medallion. Luke went on to run Simon Law’s Surf School for the next 8 years, meeting lots of new people & building up a huge clientele, making lots of great friends along the way. Along the way Luke also spent some time as the Team Manager of the famous Hayden Shapes Surf Boards. Doing photo shoots and trips to Indonesian Islands & also adventuring to Japan with the likes of Craig Anderson, Laura Enever & Chris Michalak. In between seasons Luke travelled over to Vancouver Island to Tofino a sleepy little surfside village where he taught at his good mate Sepp Bruhwiller’s Surf School, Westside Surf School. Luke was also Sepp Bruhwillers personal trainer getting him ready for several competitions. Another line Luke got into was manufacturing his & his stepfathers’ own surf board line Asylum Surf Boards where he spent many hours in the factory on the production line, trying to get their surf boards out there. In about 2008 the opportunity came to purchase Simons Law’s Surf School & he jumped at it with a partner. 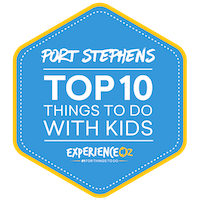 Changing the name to Port Stephens Learn To Surf. This business operated for the next 3 years off Birubi Beach & Fingal Beach. Having run Simons Laws Surf School for so long it was only obvious that all the old faces would come & try out the new Surf School. Then in 2010 another great opportunity came around & that was to buy Anna Bay Surf School off good mate Warren Keough. Luke purchased the surf school & in 2011 with his business partner leaving, Luke decided it was best to merge both surf Schools. 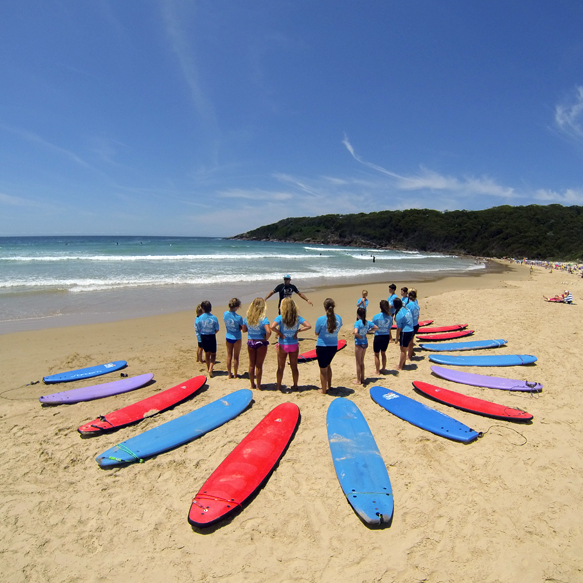 Port Stephens Learn To surf & Anna Bay Surf School became what is now Port Stephens Surf School. Luke now has his brother Chris and sister Kelly as staff, with all 3 off them catching there first waves on the shore breaks at Fingal Bay. 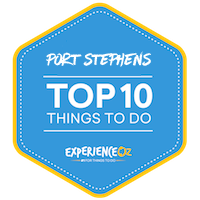 Local Knowledge can’t get any better than this family spending every day in the waters of Port Stephens. Port Stephens Surf School is owned and run by Luke Michalak. Luke has been involved in fitness for his entire life with a background of personal fitness and wellbeing, a certified Thai Boxing instructor and mentor. Now with a great professional world class crew operating off the 4 beaches on the East Coast, Port Stephens Surf School is now firing to its full potential and with the likes of Luke Michalak, Kelly Michalak, Chris Michalak & Oliver Troughton as our head watermen/coaches, along with our friendly office staff Managed by Alyssa Wallis, Port Stephens Surf School is here to offer all our customers and friends an experience of a life time.